The 1,059 square mile Coquille River Watershed is the largest river system in Oregon to originate from the Coast Range. The majority of the Coquille Watershed lies in Coos County, Oregon, with sections of Douglas and Curry Counties. 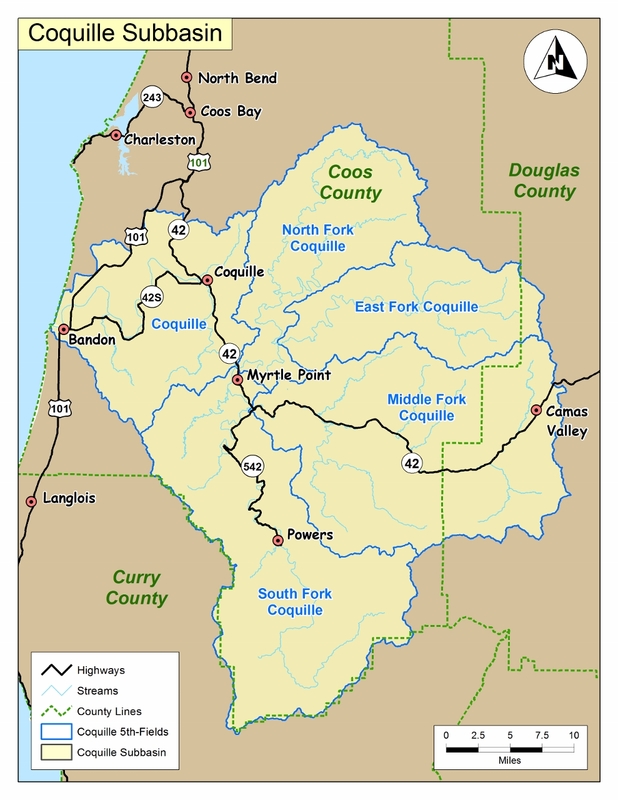 The Coquille’s three major tributaries; the North (including the East Fork), Middle, and South Forks join the mainstem within a few miles up and down stream of the town of Myrtle Point and flow into the Pacific Ocean at Bandon. Although the watershed is large, the estuary of the Coquille is one of the smaller in Oregon. The lower bay of the Coquille is long and narrow, measuring about 763 acres. The estuary contains over 400 acres of tidelands and permanently submerged land. Eelgrass beds, wetlands, and tidal flats provide feeding, spawning, breeding, nesting, and nursery areas for many species of terrestrial and aquatic life. Despite the historical diking and filling of many acres of wetlands, creek, and slough environments, the lower river area continues to be a very important rearing environment for anadromous fish such as Coho and Chinook salmon. Currently, the population within the watershed is estimated around 16,000 people. The population is concentrated in the valley areas with the majority clustered around the incorporated towns of Bandon, Coquille, Myrtle Point and Powers. The more densely populated valley areas are confined to the flood planes along the main stem, four forks, and larger order streams. Land uses in this area are predominantly residential and industrial sites commercial and service business, crop and pasture lands, and gravel extraction. Pastureland does extend into the hills above the flood planes in some areas. The steep slopes above the valley areas are very sparsely populated. Timber production, agriculture, and some mining are the predominant land uses. Approximately 70% of the watershed is forested. The upper reaches of all four forks of the river and most tidewater streams are commercial forests.